Cactus Pear perfection – cool cactus pears still in season and ready to eat! 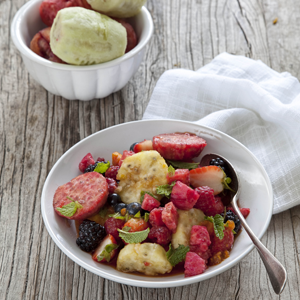 Even though temperatures are dropping, you can still get your hands on one of summer’s hottest tastes – crisp, colourful and cool cactus pears. Whilst the main season for these vibrant jewels is coming to an end, the sweetly succulent Skinners Court variety is still widely available right through until the end of May. You may have to wait until November to get your hands on a delicate white-fleshed Morado, a sunshine-orange Gymno or a ruby pink Algerian cactus pear again, but you will still find large quantities of the green or red-skinned Skinners Courts adorning a market shelf near you. Palm tree green, beach sand white, sizzling hot pink and sunset orange…these are the shades of summer. 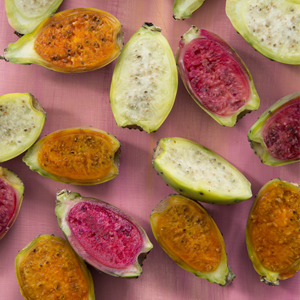 They’re also the vibrant colours of one of the season’s most delectable sweet treats: crisp, cool cactus pears, which are in season right now. There are a variety of fruits to choose from to suit every taste, including Morado, the local favourite with its delicate white flesh and subtle, fresh taste; Gymno with its deep sunshine yellow/orange flesh and wild sweet flavour; the ruby red/pink Algerian, with its crimson flesh and floral, exotic notes and the Skinners Court, a large, green fruit which can turn red towards the end of the season but retains its light green sweet flesh. 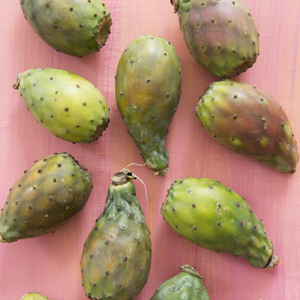 End off your Christmas lunch with a local spin on the boring old desserts with locally grown cactus pears. Sweet, refreshing and colourful cactus pears (Turksvy) are available right now and make an ideal dessert. A member of the cactus family, the sweet-tasting local varieties offer a colourful range of refreshing white/light mint-greens, warm yellowy-oranges and bright crimson-reds – the colours of Christmas!